The White House on Wednesday denied that President Donald Trump said Russia was no longer a threat to the United States. When asked by a reporter before a Cabinet meeting whether Moscow was still targeting the United States, Trump said no. However, White House Press Secretary Sarah Sanders told reporters at a press briefing later that Trump’s “no” was not in answer to that question, Trump just meant he did not want to answer questions. “The president and his administration are working very hard to make sure that Russia is unable to meddle in our elections as they have done in the past,” Reuters quoted Sanders as saying. Sanders said Trump had made it clear to Russian President Vladimir Putin that “he should stay out of US elections”. 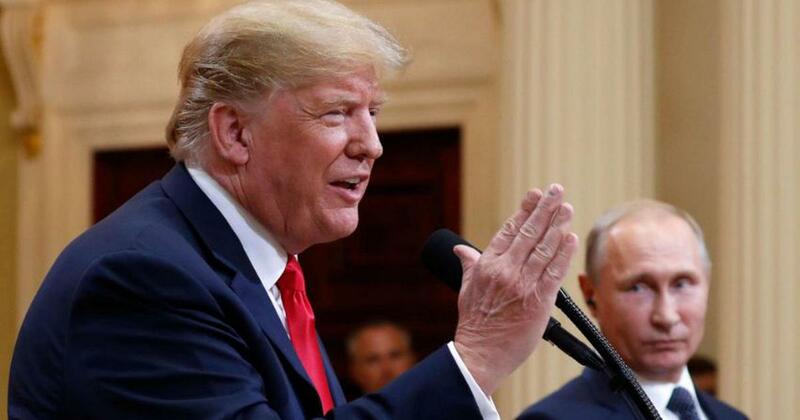 After Trump’s meeting with Putin in Helsinki on Monday, the US president had declared that he believed Putin’s claims that Russia had not interfered in the US presidential election. The remarks puts him at odds with US intelligence over claims of Russian interference in 2016 election. But a day later, Trump said he misspoke during the summit. US intelligence chief Dan Coats on Monday said that Russia was involved in “ongoing, pervasive efforts to undermine our democracy”, according to Politico. He told a congressional committee in February he had already seen evidence that Russia was targeting the upcoming mid-term elections in November. During the summit, Putin reiterated that “the Russian state has never interfered and is not going to interfere into internal American affairs, including election processes”. This came after a US grand jury charged 12 Russian intelligence officers with breaching the Democratic party’s computer networks in an election hacking case.